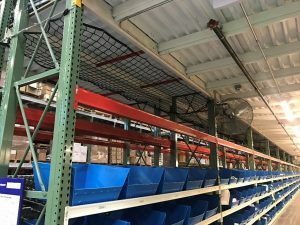 Pallet rack netting is a smart, economical safety accessory attached at higher rack levels to prevent inventory, cartons or debris from falling through the rack system. Safety netting is the umbrella term used for all net-based rack guarding methods used to enhance warehouse safety and loss prevention efforts. The netting can be affixed to the front, rear, or top of the pallet rack to protect pedestrian walkways, tunnels, and work areas. It can also be used to protect pallets from encroaching on the flue space between racking systems which is in compliance with National Fire Protection Association (NFPA) regulations. Safety netting is customizable to fit your system specifications and is easy to attach to system uprights and beams. Safety netting is most often attached at regular intervals on the upright and then stretched across the rear of the rack bay to secure the pallets/inventory in place. Horizontal guards — catch nets set below the pallet bay to capture items that fall from the above bay (another option to wire deck). Apex will help you choose the best safety netting product for your pallet rack systems and facility workflow. The Rack Repair App…or 2. the Apex PRO’s Rack Auditors. 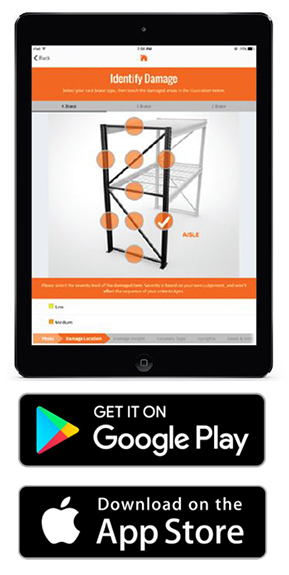 Apex Rack Repair Mobile App provides Do It Yourself capability to conduct a complete pallet rack system audit. The app prompts you for key specs and photos as you identify system damage on columns, struts, baseplates, anchors, and beams. You can also take notes about wire decking, supports, load deflection, proper flue space, and more. If all that sounds like something you’d prefer to Leave it to the PROs … Apex still has you covered. Apex PROs rack inspectors will come to you and handle your complete audit using the Rack Repair Mobile App. Our Promise – Whether DIY with the app or a PRO audit you’ll receive a comprehensive rack inspection report with an independent solution recommending steps for system repairs and maintenance. Safe, “healthy” rack is a key component in warehouse optimization. The Apex Rack Repair Mobile App is here to help. Download the app today, call us or visit our website for more information.